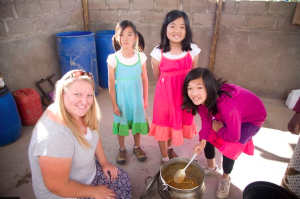 Full-time UK volunteer, Catherine Clarkson, with the Shin kids as they serve chicken feet and broth at a South African care centreSam Shin, his wife Shua and their four children have been a part of the Hands at Work family for the past six weeks whilst this church-planting family have been on sabbatical. They desired to "rest in Christ" and to expose their children to the reality of life for orphans and vulnerable children in Africa. The Shin family fully embraced the Hands at Work 'culture' and have taught us what a Godly family looks like. They've essentially become working limbs of this part of the Body of Christ. We will miss them when they leave tomorrow. Below Sam shares about the hope we have in Christ. For more on their African adventure and photos, visit Sam's blog. We made another round of visits to Belfast, a poor region in the eastern part of South Africa. And as we made our way up the home of a girl about 16-years-old, we noticed she had began to weep. She was sitting in a chair wearing knee-length, striped stockings. We sat around her as she sat there, crying. When we asked her to share her story, you could tell she was hesitant to say too much. Our group was large as my family of six was there along with Levy who is the regional coordinator, a couple of care workers and a couple of field workers. When Levy asked if anyone had any encouragements for her, I couldn’t but say something. Hopefully I didn't speak because I felt that as a pastor everyone was waiting me to say something, but instead it was because the Lord had laid something upon my heart. I shared with her from 2 Corinthians 4: Those in Christ have a treasure in a jar of clay. Even if that jar should break the treasure is secure because God has secured it through His Son’s blood. Anyone who has that treasure will, one day, see the Lord forever. No longer with a body like a jar of clay, but a perfected body. And that even she, in her inability to move her legs, would one day be made whole as a daughter of God, should she completely trust in Him. After the talk we prayed over her and were encouraged to hear that she actually felt better in her spirit. You could sense it in her smile and her laughter as we closed and prepared to leave. The sad part of her story is really her background: She most likely has AIDS and her inability to move her legs is just a symptom of a much more serious condition. This is where her real problem lies. If she has AIDS, and is dying, she gets supported by the government with a stipend. But if she gets better, she gets nothing. And so, she has intentionally avoided taking her anti-retrovirals (ARVs) and, as she gets sicker, she gets financial support. But obviously, what she doesn’t realise is that her perspective is literally killing her and then what good is the money in the end? I can’t imagine a direr dilemma. But sadly she fails to miss the point that she shouldn’t rely on the government for support, but on Christ. And ironically her name is Seneka which means “Happiness” in Shangaan, a dialect of Tshonga. We have met so many Seneka’s since we have been here. I don’t know if there would be any hope at all if we didn’t have Christ. I think it would be so easy to slip into despair. But thanks be to God that our Lord is still sovereign even in the midst of such situations.